Bath salts are not yet a staple in our bath regime. It is gaining popularity though. Bath salt is a mixture of Epsom salt/sea salt, essential oils and clays. It can be crystalline or in powder form depending on its use. Bath salts contain minerals like magnesium, potassium, calcium, bromide and sodium. These minerals are known to cleans and detoxify our skin. Magnesium helps us fight stress and combat fatigue; calcium keeps water retention in check, promotes healthy bones and can help stave off osteoporosis; potassium balances moisture levels in the skin; bromide soothes tired, sore muscles; sodium plays a significant role in managing the balance of lymphatic fluid in our bodies. 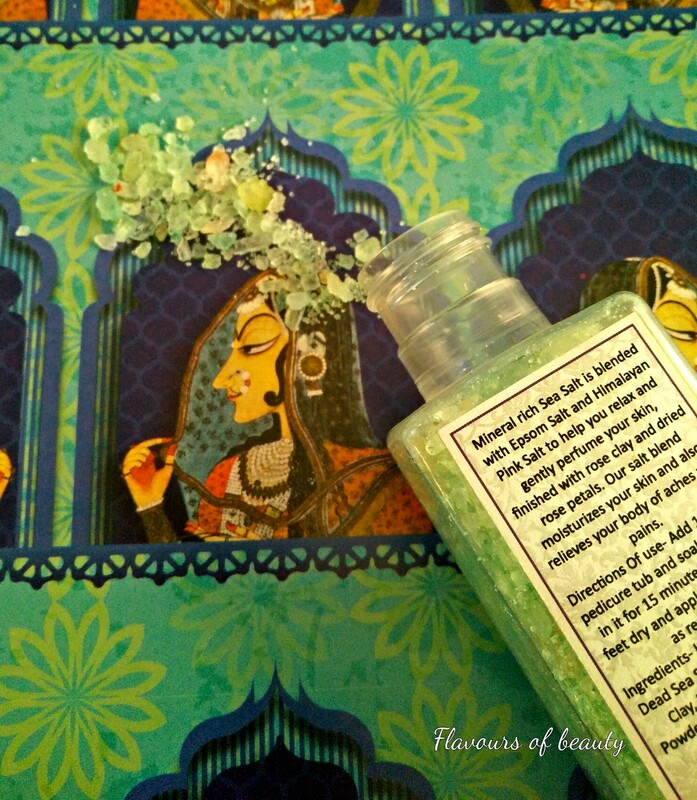 Adding bath salts to bath water not only imparts soothing fragrance to skin, but also relaxes the muscles. Dead sea salts are known to be effective in managing symptoms of arthritis and muscle sores. Essential oils in bath salts energizes/ relaxes mind and body. 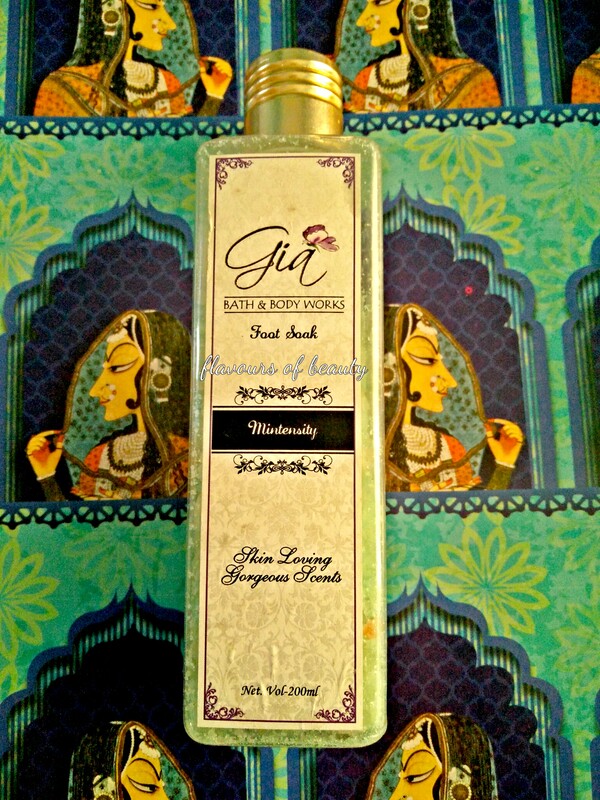 Makes skin smooth, soft and supple. Can be used for exfoliation or as foot soak. I am not sure if all these claims are true about bath salts. Probably using it regularly over a period of time really makes a difference to skin. Mintensity is a mint green coloured foot soak salt from the brand Gia. I use it as a bath salt by adding a spoon full to a bucket of bath water or as a foot soak salt when I do pedicure. Ingredients: Dead sea salt, Epsom salt, Himalayan pink salt, rose clay, rose petals, almond powder, essential oils/fragrance. Fragrance : Soothing and relaxing fragrance. Can’t say it is minty. It is a fragrance blend and smells very pleasant. It is not a floral or fruity smell. I am not a regular user of bath salts. When ever I feel stressed out or get a foot pain, I add this to bath water. I add a tea spoon full to a tub of warm water and soak my feet in it for 30min. The salt dissolves in the water and a film of oils can be seen on top. After that I dab my feet dry and scrub the feet with the some salt. I massage the flaky skin with damp coarse salt for a while and then wash the feet. There is no need for moisturisers after, as the oils in the salt mixture hydrates the skin well. The soothing aroma relaxes my sore muscles and the fragrance stays for a while. This can be made at home by mixing sea salt crystals with essential oils. Salts in market comes in different hues and you need to pick the ones specific for your need. Colours like blue and lavender are supposed to be calming where as hues like red and orange are energizing. The brand also offers a separate bath salt variant. Next PostNext Lips Don't Lie!! !